Conversation of Dr. Liviu Olteanu with H.E. Ambassador Abdallah Yahya Al-Mouallimi, Permanent Representative of Saudi Arabia to United Nations in New York and with Sheikh Salih bin Humaid, Imam of the Grand Mosque of Mecca. The following statement was issued by the AIDLR Secretary General after the meeting at the United Nations Headquarters in New York between Dr. Liviu Olteanu and H.E. 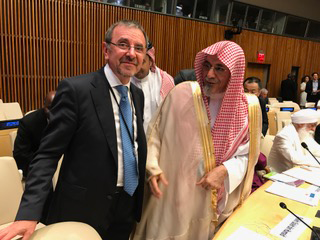 AMBASSADOR ABDALLAH AL MOUALLIMI and SHEIKH SALIH BIN HUMAID, Imam of the Grand Mosque of Mecca, at the Launch by the Secretary-General of the United Nations, Antonio GUTERRES’ ‘Plan of Action for Religious Leaders and Actors to Prevent Incitement to Violence that Could Lead to Atrocity Crimes’. Both parties involved had an exchange regarding possible future cooperation on fostering dialogue, respect and understanding between all religions and people, by education of state and religious actors and international exchanges that can contribute against misunderstanding of others’ religion and against incitement to violence based on religion.